Frank and his wife, Patti, learned the fundamentals of vaulting from Paul Kathen, a visitor from Germany who brought with him a piece of equipment peculiar to the sport — a vaulting surcingle, a strap made of leather or similar material that passes around the body of a horse. “The basics of vaulting come from [the island of] Crete,” explained Frank. “Similar to our rodeo bullfighters, they’d taunt the bull and as it came by [they] would grab its horns and vault on board. It became a part of the cavalry training, to dismount and mount on a running horse. Like everything else, it got turned into a competitive kind of thing. It was actually a part of the Olympics until 1920.” Modern gymnastics, in fact, mimic vaulting — just without the horse. Frank and Patti grew up riding Western. They had seen trick riders all their lives. When they discovered vaulting in the late ’70s, they used it to improve their riding skills. Though Frank will probably never ride again competitively, he does ride with his grandchildren through the woods. Nowadays, he trains vaulting horses and prepares his Pacesetters for the show ring. The arena holds no surprises for Frank, who has won blue ribbons over the last 50 years in lots of different disciplines, including hunter-jumper and dressage, western pleasure and trail horse events. 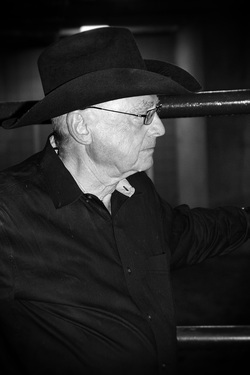 Things change: On his 75th birthday he competed in a Western Dressage show . The first time in a show in almost ten years. After starting to ride again only for only a month and a half, he came home with three first-place blue ribbons. He gives credit to his wife, Patti, who coached him and to Gus, our vaulting horse.